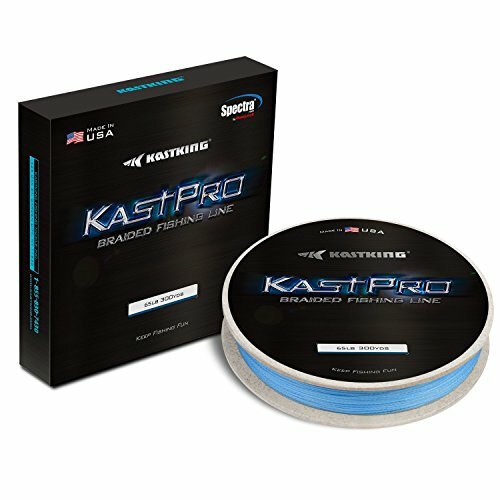 KastKing KastPro Braided Fishing Line - Spectra Super Line - Made in The USA - Zero Stretch Braid - Thin Diameter - On Biodegradable BioSpool! - Aggressive Weave - Incredible Abrasion Resistance! Made in the USA Proudly made in the USA using the finest braid machines and run by the most experienced technicians in the world ensure that KastPro braid is simply the best available. Built Aggressive for Extreme Conditions KastKing KastPro Braid is brute strong because of our aggressive Diamond Weave which increases abrasion resistance and is perfect for the toughest fishing conditions such as heavy cover, vegetation, rocks and underwater wood structure. Using Spectra fiber and our unique Diamond Weave process, KastPro 4 strand braid outperforms any 8-strand braided line in the market. Minimum Stretch Extremely low line stretch means that you have increased hook setting speed and power. In addition, it provides incredible sensitivity, so you ll feel even more strikes and be able to quickly penetrate the hook and land more fish. Pro Angler Approved KastPro Spectra braid is on the reels of Bassmaster Elite Anglers, professional fishing guides, charter captains, over 60 Team KastKing Pro staff and independent testers. The results were consistent. When they want the strongest, thinnest and most abrasion resistant 4 carrier braids, they trust KastPro. Fish with KastPro Spectra Braid Anywhere KastPro braided line is ideal for saltwater surf casting, jetty fishing, pier fishing, bass fishing around heavy cover, trout fishing in rocky freshwater, boat fishing, kayak fishing, or any other type of fishing. KastKing BioSpool KastKing has raised the bar for corporate environmental responsibility in the fishing tackle industry. KastKing fishing line BioSpools will break down in a landfill helping to decrease landfill bulk. KastKing BioSpools are made with wheat straw waste products and will replace traditional hard plastic spools. 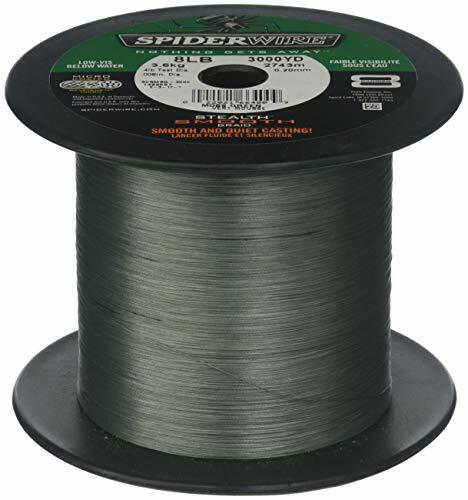 MADE IN USA - KastPro 4 carrier Spectra braid fishing line is proudly manufactured in the USA in our ISO 9001 and Aerospace AS 9100 certified facility to ensure the highest quality possible. Tested and approved by Bassmaster Elite anglers, professional fishing guides, charter boat captains, and select Team KastKing Pro Staff members. AGGRESSIVE DIAMOND WEAVE - Thin but exceptional strong Diamond Weave is incredibly tough and abrasion resistant. 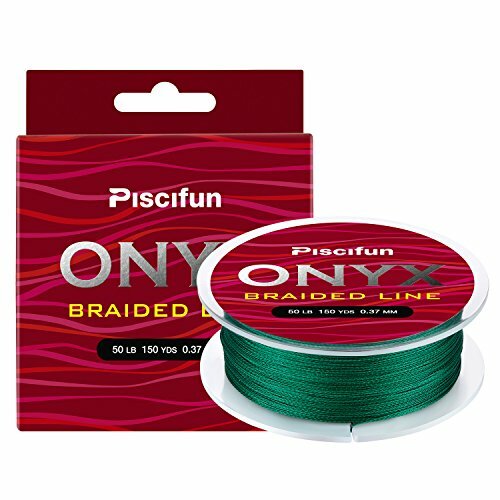 It is the perfect braid for the toughest fishing conditions such as heavy cover, vegetation, rocks, and underwater wood structure, outperforming any 8 strands braided line on the market. SPECIAL COATING - KastPro is coated to be color fast and has better abrasion resistance. Other brands use a water based coating which tends to merely rest on the surface of braid line and is naturally repelled by the braid material. This results in color fading and reduced abrasion resistance over time. The KastPro process uses a bio solvent based coating that penetrates and wicks into the braid for a more uniform coating with better color, coating life, and increased abrasion resistance. GREAT CASTABILITY - KastPro Spectra braid's round, smooth finish delivers long, easy casts for both freshwater and saltwater fishing. 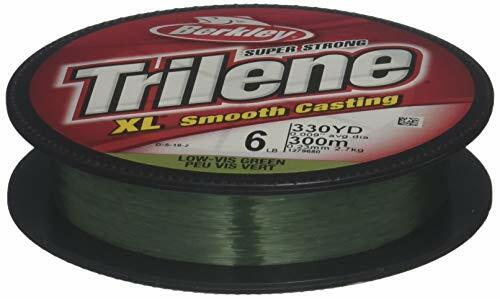 It leads the industry with the thinnest possible diameters per rated breaking strength in a 4-strand braided fishing line. Low stretch properties means faster hook sets and greater sensitivity. 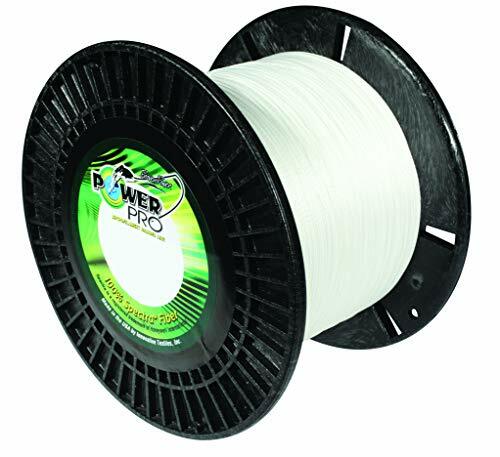 BIOSPOOL -As an extra benefit to our environment, KastKing KastPro fishing lines are spooled on our KastKing BioSpools, which are made with wheat straw. Unlike plastic spools, BioSpool will decompose naturally to reduce landfill bulk. KastKing is an ICAST award-winning manufacturer. 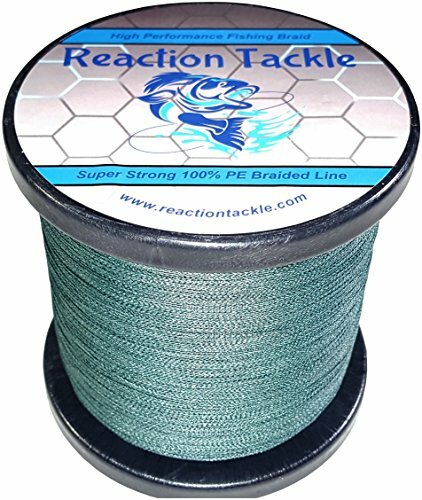 1.FISHINGSIR Super Dyneema Braid was made from top-grade dyneema fiber,and braided with special technology,waterproof and superior abrasion resistance. 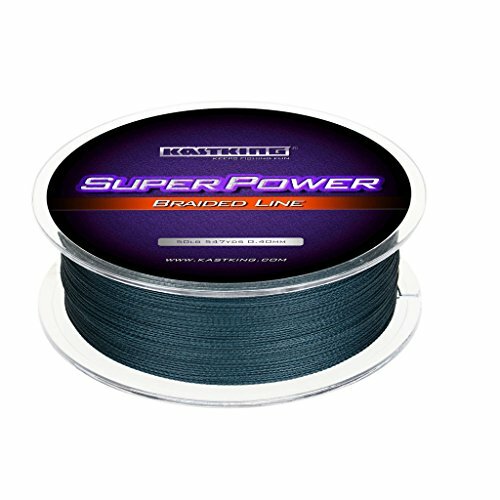 2.With advanced compression process,Super Dyneema Braid offers much smoother surface, which effectively ensured the longest casting distance. 3.The lowest extension ratio and super sensibility make it possible to feel the biting of the hook immediately. 4.The Super Dyneema Braid's tensile strength is three to six times as powerful as common nylon line,meanwhile,with super knot strength. FISHING FRIENDLY - GODLINE is created to provide multi-purpose superline at affordable price. We cut price in unnecessary spending to give more values to anglers. It has approved high tensile, great abrasion resistance, superior sensitivity, low spool memory. HIGH TENSILE & ABRASION RESISTANCE - Imported PE fibers, braiding tech and teflon-coating make GODLINE extremely tight, zero water absorption for high abrasion resistance and effectively prevent the line being damaged. 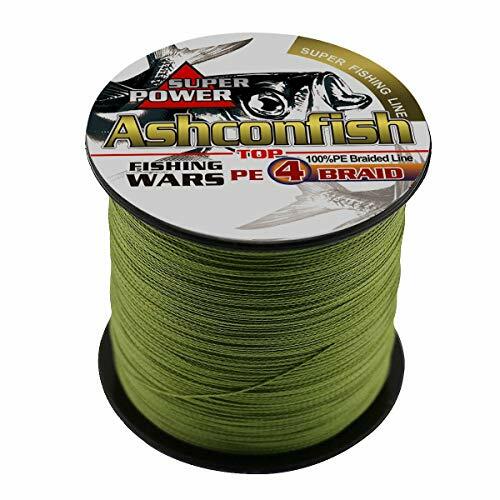 EASY TYING & STRONG KNOT STRENGTH - It was approved by laboratory test and our anglers' using experience, you can easily tie a more solid knot than most other brands. And, several different knots can be used with GODLINE: such as Palomar knot, Berkley Braid Knot, San Diego Jam Knot, Trilene knot, Albright knot etc. SUPERIOR SENSITIVITY & LOW MEMORY - Unlike mono's shock strength, GODLINE has very little stretch, making rigs very sensitive to even very small fish bites. Zero stretch to avoid your fish coming off. And, it features low memory, which reduces backlashes and wind knots. 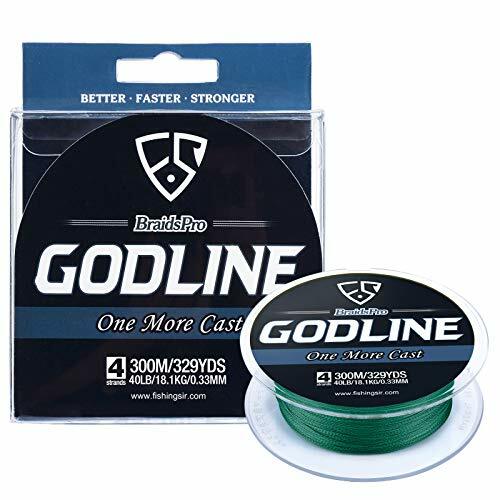 ENJOYABLE & AFFORDABLE - GODLINE 8LB to 50LB fishing line is made with 4 strands while 65LB to 120LB has 8 powerful strands for higher tensile strength. Combination of smaller diameter, stronger strength and fishing-friendly features. 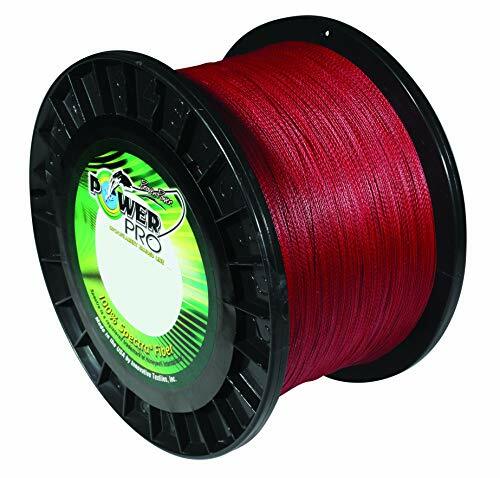 Power Pro Spectra Vermilion Red Braided Line is braided fishing line. In recent years, line makers have put greater focus on how different shades of line appear underwater. Since shades of red fade underwater first, this red line turns gray once submerged. This gray tone will help to blend the line in to the background and become much less visible to most species of fish. Under most water clarity conditions, the color red will completely fade out at a depth of 14 feet. Therefore, when targeting fish in depths of 20 feet or greater, this red line is ideal. 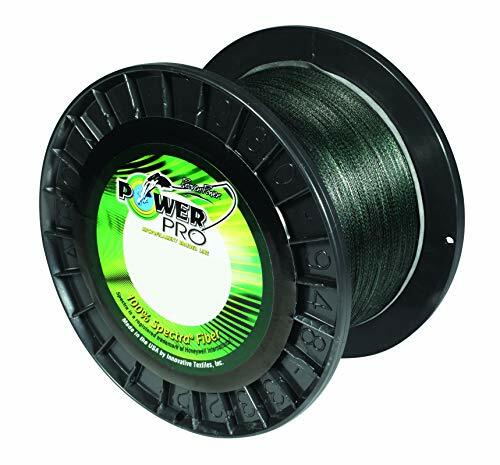 Whether you are deep cranking for bass; trolling for lake trout, walleye or salmon; or bottom fishing in deep rivers Power Pro Vermillion Red Spectra Braided Line should be on your reel. It also features a new dye concentration system that eliminates color bleeding. 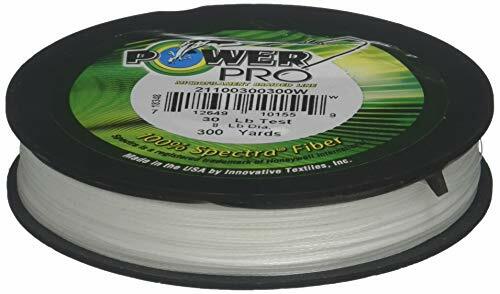 Features Enhanced Body Technology (EBT), Power Pro Spectra Braided Line is the roundest, smoothest, easiest to use Superline on the market. Unparalleled sensitivity and hook setting power let you feel the smallest strike and set the hook with confidence. Abrasion resistant for fishing all types of structure, it is smooth and slick for superior casting performance. Perfect for conventional or spinning reels, its superior strength-to-size ratio also enables you to fish with lighter and more compact reels. Available in a wide range of pound tests, from 5 to 200 pounds. The Power Pro Spectra Vermilion Red Braided Line is premium braided fishing line. Braided from 100% Spectra fiber - a registered trademark of Honeywell International. Available in a wide range of pound tests, from 5 to 200 pounds. 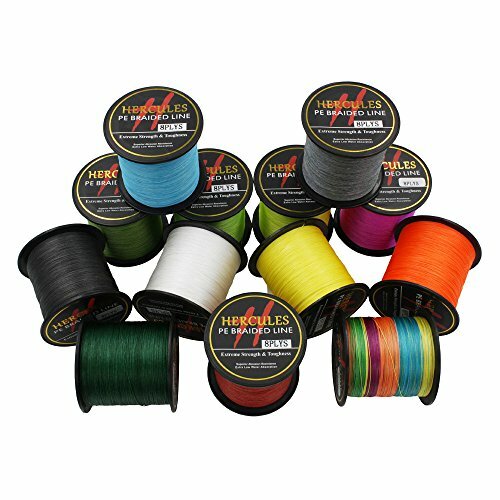 Type: 8 Strands Color: Various colors are available Length: 1000m/1094yds Size: 10lb/4.5kg 0.12mm - 300lb/136.1kg 1.20mm Hercules premium braided fishing lines are designed to catch more fishes for you! It gives you the sensitivity to feel the lightest bite, the control you need for a secure hookset, and the strength to endure the toughest fishing condition. Regardless of the species you're after or the cover you're fishing, Hercules will ensure that nothing gets away! 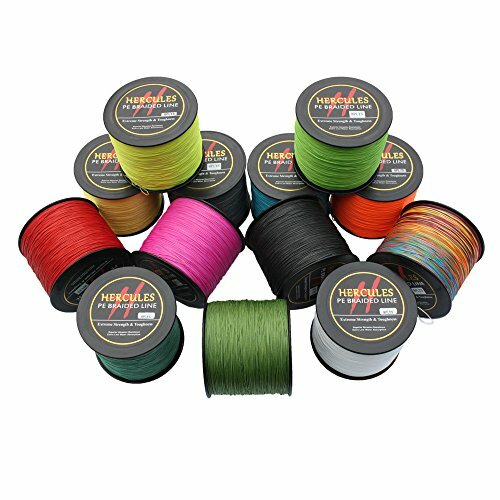 Type: 8 Strands Color: Various colors are available Length: 300m/328yds Size: 10lb/4.5kg 0.12mm - 300lb/136.1kg 1.20mm Hercules premium braided fishing lines are designed to catch more fishes for you! It gives you the sensitivity to feel the lightest bite, the control you need for a secure hookset, and the strength to endure the toughest fishing condition. Regardless of the species you're after or the cover you're fishing, Hercules will ensure that nothing gets away! 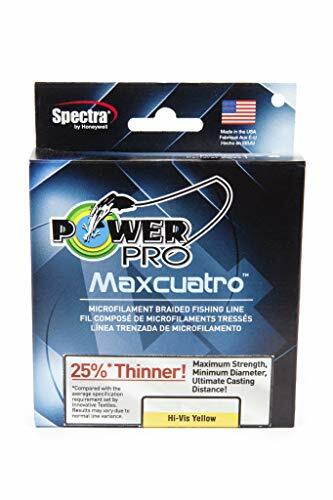 The Power Pro Maxcuatro Spectra Hi-Vis Yellow Braided Line is 4-carrier braided fishing line. It features the latest technology in Spectra fiber and it is 25% thinner than existing PowerPro lines with equivalent strength. Also, Maxcuatro optimizes casting distance while increasing your reel capacity. 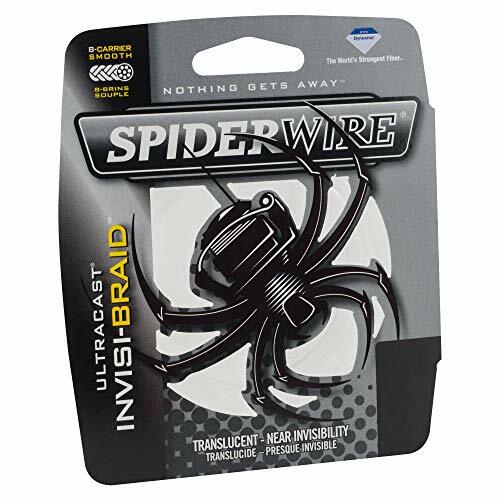 Incredibly strong as well, its advanced 4-carrier braid construction utilizes the newest Honeywell Spectra HT fiber. Hi-Vis Yellow is designed for applications where a high visibility line is necessary. It is typical for anglers to use a short fluorocarbon leader with hi-vis lines, especially in clear waters. The angler is able to accomplish the goal of having a line that is invisible to fish that are close to the bait or lure by adding fluorocarbon. Typical Hi-Vis Yellow PowerPro applications range from bobber fishing the rivers of the Great North West to Fly-lining sardines and anchovies along the California coast fishing the lakes and rivers of our Nation's central regions for bass, walleye and catfish to targeting Fluke and Stripers in the North East; pelagic fisherman looking for better spread management on the troll to inshore fisherman targeting Snook, redfish and trout. High visibility lines can be used in all applications. Available in 17 sizes. 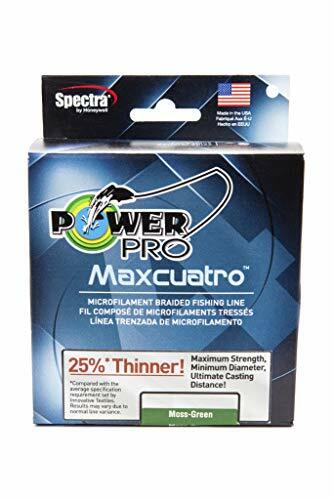 The Power Pro Maxcuatro Spectra Hi-Vis Yellow Braided Line is 4-carrier braided fishing line. Designed for applications where a high visibility line is necessary. Available in pound tests ranging from 20 pound to 80 pound.